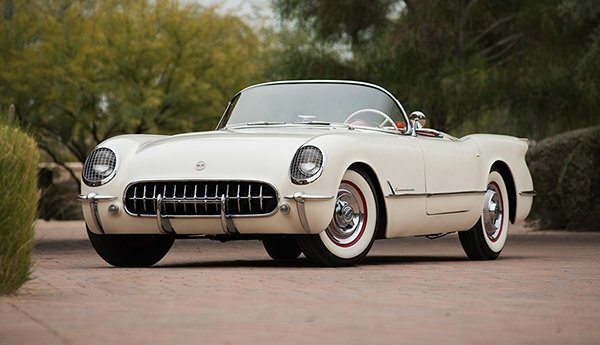 This 1953 Corvette is the 30th of 300 produced and goes to auction in January 2018. In this article we look at several 1953 cars that were in the Motorama that year. 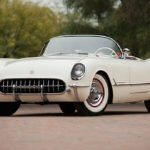 Fine examples from the very first GM Motorama in 1953: a Buick Skylark (Lot #1353), Cadillac Eldorado (Lot #1353.1), Oldsmobile Fiesta (Lot #1353.2) and Chevrolet Corvette (Lot #1353.3) – all selling at No Reserve at the 2018 Scottsdale Auction. The American auto industry after World War II reflected both the unflappable optimism of our nation’s population and the enormous capabilities of the manufacturing sector. There was no dream too big, too audacious or too challenging to tackle. It was time for The Greatest Generation to take their talent and their ambition and use it to launch a huge postwar expansion to take the country to the next level. Nowhere did that optimism manifest itself more visibly than in Detroit, where the Big Three automakers began producing dazzling dream cars to wow the public with what they could do. General Motors, the nation’s largest automaker, created a traveling show called Motorama, a showcase of high-end dream vehicles for the public to view, along with entertainment to further impress the crowd. The first GM Motorama in 1953 opened at the Waldorf-Astoria in New York, where on the first day it drew 45,000 visitors who took in the fleet of cars, along with singers, dancers and a full orchestra. By the time the ’53 Motorama show had travelled the country, more than 1.4 million people from sea to shining sea had visited the exhibit to see what GM had created. The stars of the Motorama shows were the cars, of course, and GM decided to go big with its vision for 1953, creating four show cars produced in limited numbers that the public could purchase. All four were what today would be called “halo cars” – top-of-the-line creations that represented the best each brand had to offer. All four were convertibles, too; three luxury cars and the debut of what would become America’s most iconic – and long-lasting – performance car. 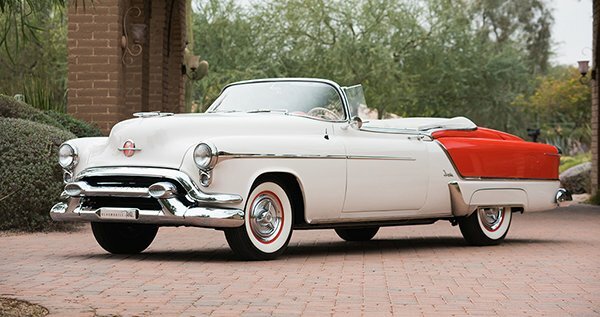 At this year’s Barrett-Jackson Scottsdale Auction, bidders will have the opportunity to acquire examples of each of the 1953 Motorama cars, all from the well-known DeAtley Collection, all selling with No Reserve on Saturday, January 20, and all restored to show-car levels of quality. Of all the GM Motorama cars, the Skylark was the most successful, at least in terms of units sold. 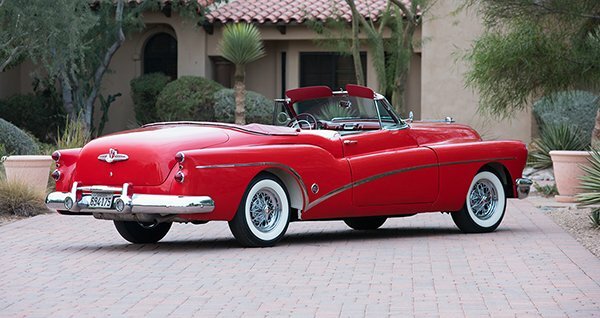 Buick managed to sell 1,690 1953 Skylarks, which is a total greater than the other three GM Motorama cars combined. This despite the Skylark carrying a $5,000 price tag, which represented a 43-percent premium over Buick’s still-ritzy Roadmaster convertible. That said, it’s easy to see why the Skylark sold for top dollar. Largely handmade, the Skylark was elegant and fashionable, with several distinguishing characteristics, including its “Sweepspear” chrome side trim that ran virtually the length of the car and a lower beltline, as well as the Kelsey-Hayes chromed wire wheels. Mechanically, the Skylark had a lot going on, too, as 1953 marked the first year of the 322ci Buick Fireball V8, also known as the “Nailhead,” and the 12-volt electronics. Lot #1353 features a stunning color combination: The exterior is Matador Red, one of seven colors offered on this model, while the interior is Helsinki Red over white. Gorgeous, simply gorgeous. Among the 1953 Motorama cars, the Cadillac Eldorado was the best of the best, the very top-of-the-line offering from General Motors. It was also the priciest, carrying a Window Sticker of $7,750, about $72,000 in today’s dollars, and a whopping $3,000 more than a 1953 Cadillac Series 62 convertible. Little wonder that GM sold just 532 examples of the first-year Eldorado. Discerning buyers found a lot to like in the new Cadillac model. 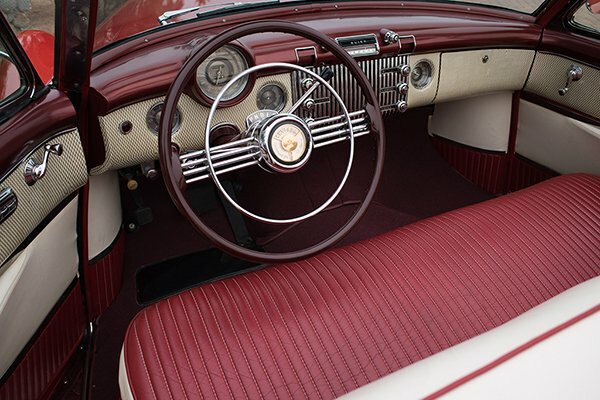 GM design chief Harley Earl and his team made significant changes with the Eldorado, which was longer and lower than the Series 62, with cut-down doors and a wraparound Panoramic windshield. Wire wheels were standard, as was a flush metal cover to conceal the top when it was folded. 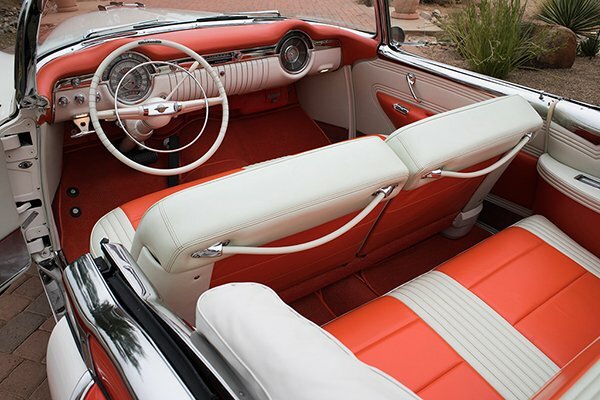 The name Eldorado is derived from the Spanish phrase El Dorado, which means “the gilded one.” With the interior made from the finest leather and all manner of comfort and convenience features, this was indeed the gilded one of the automotive world. 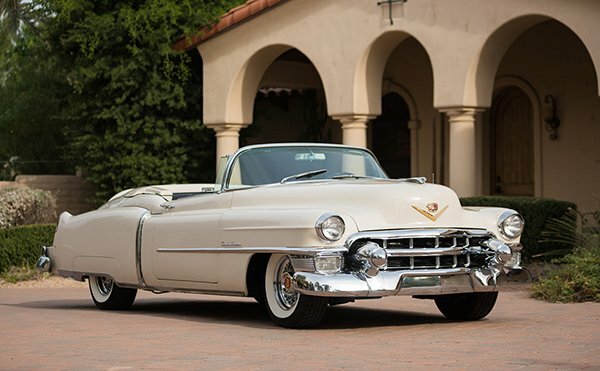 For 1953, the Cadillac Eldorado was offered in just four color choices. 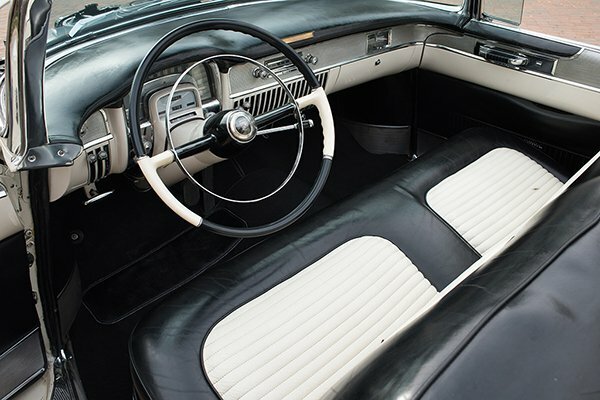 Lot #1353.1 is trimmed out in Alpine White over a black-and-white interior – one of the most iconic color schemes of the 1950s, and it looks great on this fabulous restoration. And a little piece of trivia for you: Dwight Eisenhower rode in a 1953 Cadillac Eldorado on the way to his presidential inauguration. Oldsmobile built just 458 Fiesta convertibles in 1953, making it the second-rarest of the four Motorama cars, ahead of only the Corvette, which had only 300 examples produced. At $5,715, the Fiesta cost about the same amount as an Oldsmobile Super 88 convertible and a base-model 88 coupe combined. Interestingly, 1953 turned out to be the only year the Fiesta was built, making it a rare bird indeed. The most unique styling feature of the Fiesta was the hockey-stick-shaped side trim, which separated a variety of two-tone paint schemes that were so popular back in the day. Under the hood, the Fiesta was equipped with the legendary Rocket 88 V8 engine, which produced 170 horsepower, five more horses than any other Olds model that year. Lot #1353.2 features one of the Fiesta’s best two-tone paint schemes, Raven Red over Polar White, with a matching two-tone interior. It is a stunning car, with many NOS parts. This is where an American legend began. 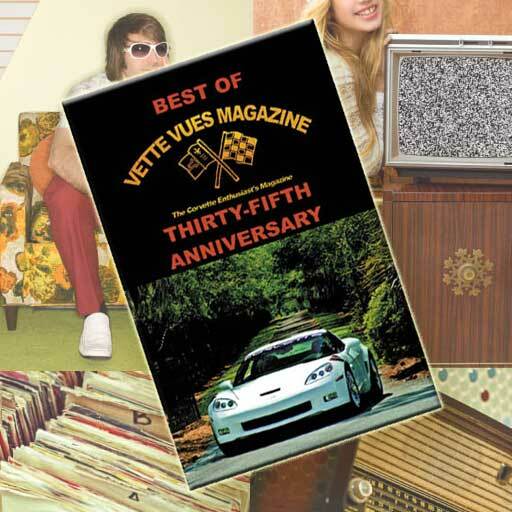 Lot #1353.3 is the 30th of 300 Corvettes produced in 1953, the first model year for arguably the greatest two-seat sports car ever built in this country. 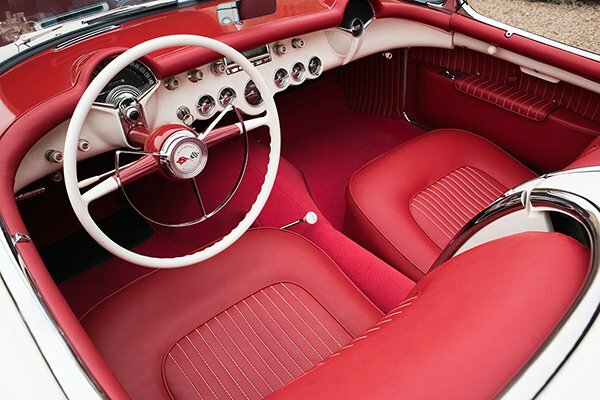 All 300 1953 Corvettes were built to the same basic specs: Polo White paint on a fiberglass body, red interior, black soft-top, a 235ci, 150-horsepower engine and a two-speed Powerglide automatic transmission. Heaters and AM radios were also standard. Interestingly, of all the four Motorama cars, the Corvette is the only one that’s remained in mostly continuous production ever since. 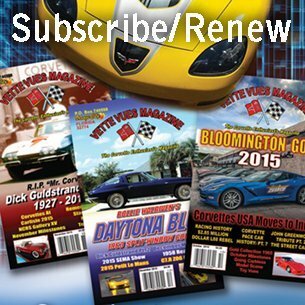 There was no 1983 Corvette, but in every other year since 1953, it’s been one of Chevrolet’s offerings. Lot #1353.3 carries important Corvette documentation with it. The National Corvette Restorers Society (NCRS) has awarded this car “Top Flight” status, which means achieved 94 percent or above of 4,500 available points to in a rigorous judging process of Operations Check, Exterior, Interior, Mechanical and Chassis Judging. It is also won the NCRS Duntov Mark of Excellence Award, which is an even higher and rarer honor. 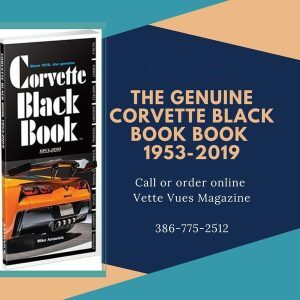 So while all 1953 Corvettes were built the same, not all were restored the same. Lot #1353.3 is among the very finest examples around, and it has the paperwork to prove it. Put simply, the DeAtley Collection of Motorama vehicles features four exceptional automobiles from one of the most significant periods in the history of the American automotive industry. All four of the Motorama cars are restored to top standards and are both rare and desirable. And all four will cross the auction block with No Reserve at Barrett-Jackson Scottsdale. Tags: 1953 Chevrolet Corvette, Barrett-Jackson Scottsdale Auction, DeAtley Collection	.